Advances in relevelling products and processes for buildings are creating cost-effective and less invasive alternatives to traditional underpinning methods. For builders and developers, innovative solutions such as Teretek engineered resin from ground engineering specialist Mainmark can also increase the ground’s bearing capacity. This ground treatment can help to re-level and re-support an existing structure and avoid the need to replace foundations or rebuild sections of a dwelling when renovating or adding the extra load of an extension. Extreme weather events including periods of drought followed by heavy storms can affect the ground on which a house sits, with changing levels of moisture causing soils to contract and expand. Many buildings in coastal areas also sit on sandy, shifting soils. These are just some of the environmental factors that can contribute to ground instability and weakness, leading to building subsidence. The resulting damage this can cause to a home, including uneven floors and cracks starting to appear in the structure, is often a catalyst for property owners to decide to undertake a renovation or extension. Teretek engineered resin is injected into the foundation soils beneath a structure’s footings, in a process likened to keyhole surgery. The unique two-in-one solution delivers both ground improvement and relevelling of the building by increasing ground bearing capacity, filling voids, and minimising soil deformation, at a significantly lower cost than traditional underpinning. Mainmark technicians inject the resin beneath the sunken sections of the affected structure using their fast, precise and controlled method. It’s possible to use Teretek to raise and relevel strip footings, raft slabs, and ‘waffle-pod’ slabs, as well as infilling slabs and driveways. 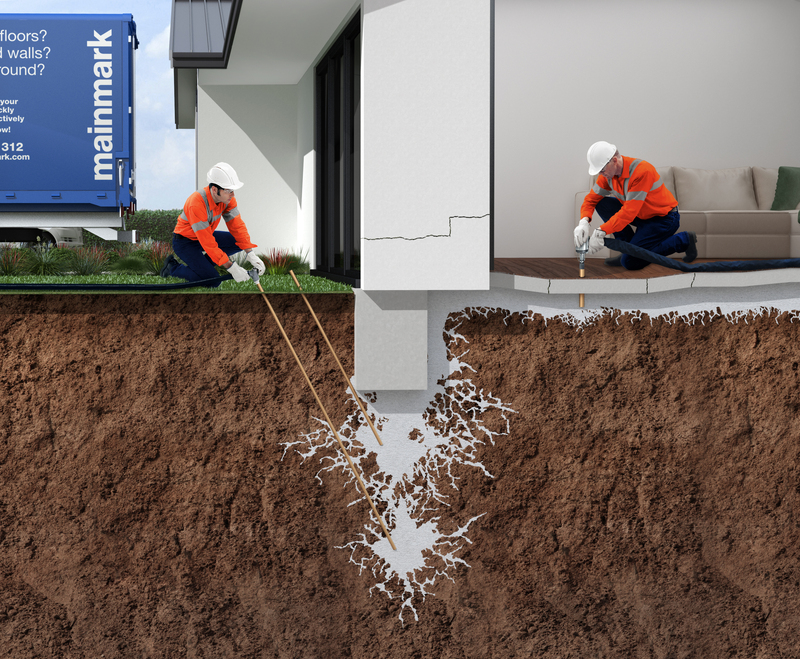 “We have seen the issues that can arise when building works, from single dwellings to multi-residential and commercial developments, are carried out without the appropriate foundation ground support,” says Mainmark Regional Sales Manager NZ James O’Grady. “Defects such as cracks in walls and sinking foundations are likely signs of serious structural issues that may present or be exacerbated if ground-bearing capacity is not addressed prior to adding a second storey or an extension to an existing structure. Resins have been used for more than 25 years and have a proven performance history, O’Grady notes.